Bullitt mustang - The Fabulous Ford Returns! The name Bullitt Mustang can mean many things to different people. For many of us, the first thing we think of, is the now famous movie Bullitt and of course the very famous car chase, involving a Hyland Green Mustang fastback being chased by a black Dodge Charger. Anybody notice the single smoking tire? Obviously there's no limited slip differential there! (Cool burnouts for both cars. It's also pretty easy to see that this quick Ford Mustang completely out handles the Charger. The original Mustang Bullitt, was a highly modified, Hyland Green 1968 fastback Mustang with a 390 cubic inch big block V8. Or was it? Well, yes and no. You see, in the 1968 movie Bullitt, actor Steve McQueen played the hard nosed cop, Frank Bullitt. His co-star, was the green 1968 Ford Mustang,which was of course seen in the crazy high speed chases in the movie. The car or actually cars, seen in the movie were product placement cars direct from Ford Motor Company, who lent them to the show and retained possession of the one surviving car. 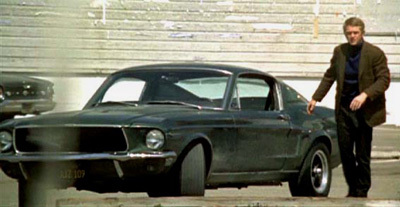 Although many modern car chases in movies and tv are actually made to look faster than they really are, the cars in Bullitt, actually were filmed faster than intended. In fact, much of the car chase sequences were filmed at speeds of up to 110 mph ! At the time, there was revived interest in the classic Mustang, from the 2000 movie Gone in 60 seconds,a remake of the 1974 movie, bringing back memories and nostalgia of the Bullitt Mustang. 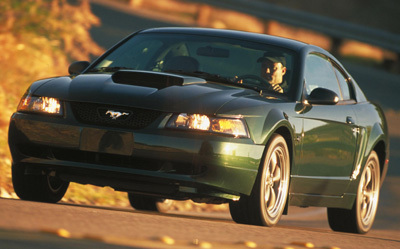 Whether or not that was the push, or just that Ford needed a new product, a new 2001 Ford Bullitt was born. Like its movie cousin, the new 2001 Bullitt, a limited edition of 5,000 cars, was offered in the iconic Dark Hyland Green as well as Black and True Blue. Like the original, the new Ford Mustang Bullitt, had a muted styling, with a de-chromed exterior, save for the Mustang grille emblem. The buying public gave a warm welcome to the Mustang as did the top automobile magazines. As mentioned in the body kit section, all you need to do to make a clone only requires some paint and detail changes to resemble the 2001 Ford. If you want to go a bit further, you can add red Brembo calipers and lower that suspension 3/4" like they did at FoMoCo and buy the Bullitt issue Side Scoop Delete parts. 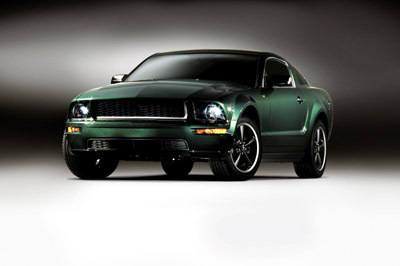 The 2008 Mustang again featured the Bullitt option to commemorate the 40th year anniversary of the 1968 Bullitt Mustang. As expected, the car appeared in its iconic Dark Hyland Green paint and was completely de-chromed, save for its two gleaming chrome exhaust tips. This bullitt received special treatment by Ford Racing in the engine compartment and power was bumped up to 315 horsepower in its 4.6 liter modular engine. And a new 3.73:1 rear end was added for more punch. And along with some minor interior trim changes, a unique serial number was attached to each Bullitt to further ensure the exclusivity of the 7,700 units that were produced.